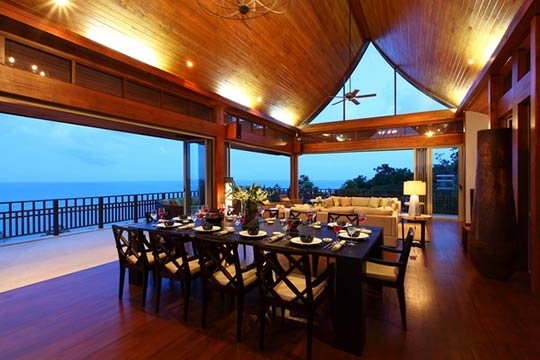 Jakawan means 'universal' and this villa certainly belongs to the bigger picture. Sitting on the cushioned sofa in the welcome sala (gazebo), gazing over the property's spired pavilions down to the dramatic coast and cerulean seas below, you definitely feel you're on top of the world. This feeling stays with you as you move through the villa's myriad spaces, with wide terraces and balconies, fold-out doors and tall windows turning the spectacular views into wall art. 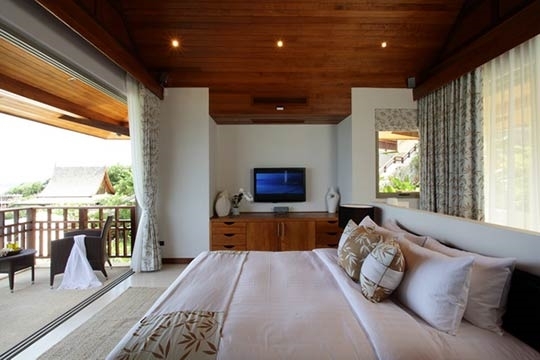 The only time you feel enclosed is when you want to be; drawing the black-out curtains to watch a movie on one of the villa's many flat screen TVs (satellite only available in the living pavilion) . 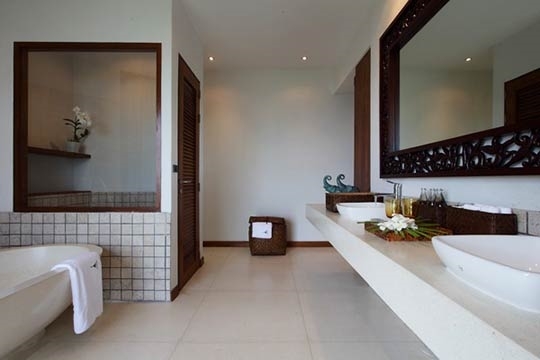 Baan Jakawan's universal design also means it's ideal for large groups or family gatherings. The furnished poolside terrace and dining pavilion can easily accommodate large numbers of guests, while in- and outdoor dinner and lounge choices allow everyone to switch between spaces as the mood takes them. Privacy is easily found in one of the many garden courtyards or on sheltered terraces, and although five of the bedrooms have adjoining walls, once inside you feel reassuringly removed from the rest of the villa (unless, of course, your neighbour decides to test the powerful in-room music system to the max!). The staff seem to know what you want before you ask, and there's always someone in attendance to meet requests. The advantage of a personal chef (provisioning on guest account) is that meals can be ordered to suit your schedule and taste. 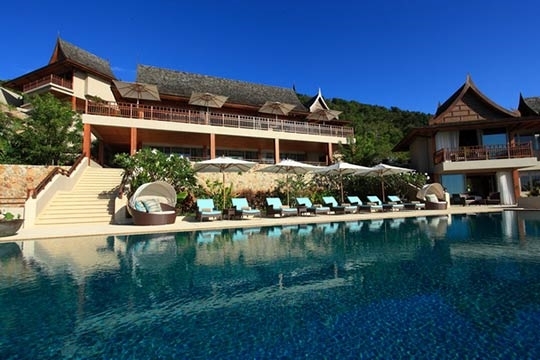 With a good choice of Thai and international fare on the suggestion menu, and the added option of a barbecue in the poolside sala, it’s unlikely you'll feel the need to head out too often. 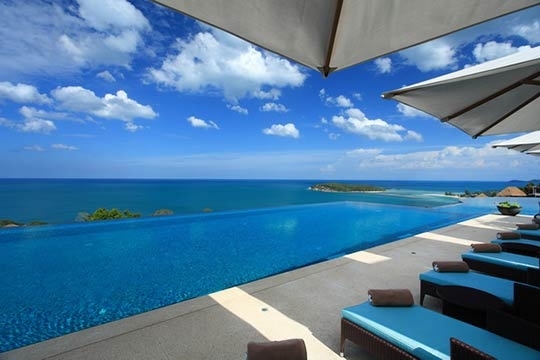 Baan Jakawan boasts what must be one of Thailand's most dramatic private infinity pools. It may not be a place for toddlers (steep drop-offs abound), but with views to die for and a cool drink waiting at the swim-up bar, it's a strain to head back to your room and change for dinner. Get high on lux design and coastal splendour. Ten minutes after arriving at Baan Jakawan we found ourselves planning a party with celebrity guests. After an hour, the party had started (who needs celebrities?). Surrounded by a cool combination of luxury, nature and high-end technology, we hardly missed the beach, even though we could see one from virtually every point in the villa (there are some properties under construction nearby, but as yet, none spoil the views). The chef's extensive repertoire covered everyone's taste and from the fresh and filling breakfast, right through to post-dinner drinks, the knowledgeable English-speaking villa manager and her diligent staff made sure we never felt ignored (although the one night we did head out for dinner, there was no-one around on our return). The music and visuals in the lounge caused initial consternation, because no-one could work out which remote to use, but once we had the iPod pumping soothing tunes into the views, such minor irritations disappeared. 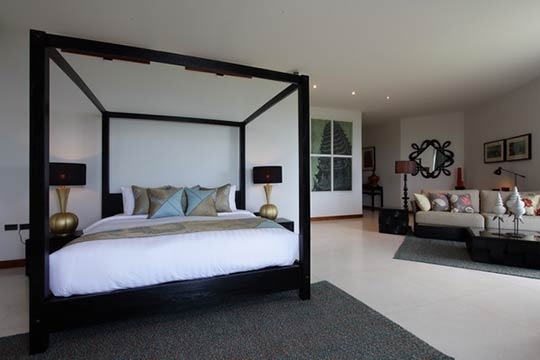 Bedroom-wise, we preferred the upper level suite to the more luxuriously appointed master, mainly because of its dramatic location and views, which made waking up an absolute pleasure. Having said that, the bathroom in the master is definitely a cut above, with a double rain shower that could rekindle even the most jaded romantic flame. For adventurous types, a hire car is a must. 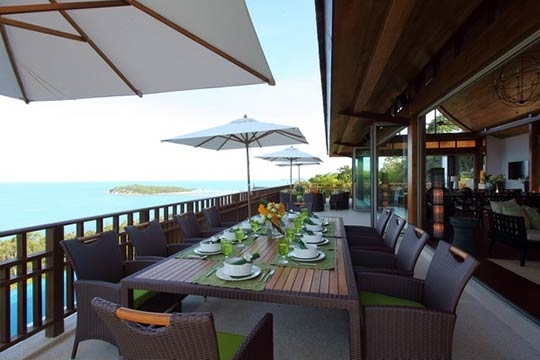 With one, you're ten minutes from the bright lights and endless dining and shopping choices along Chaweng Beach (east) or the more sedate, beachside pleasures of Choeng Mon (west). There are two or three resorts with beachside restaurants quite close to the villa but with a wide selection of dishes on the in-villa suggestion menu, eating in is a much more appealing option. The lack of a gym may concern more active guests, but the provision of a proper lap pool and the many steps at the villa more than justify your next meal. 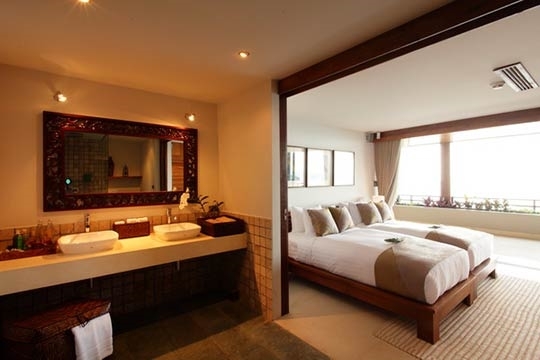 Overall, Baan Jakawan stands out as an ideal private escape – especially for a group of friends or families with older children. What's more, the attractive rates allow you to celebrate your good fortune in memorable style! 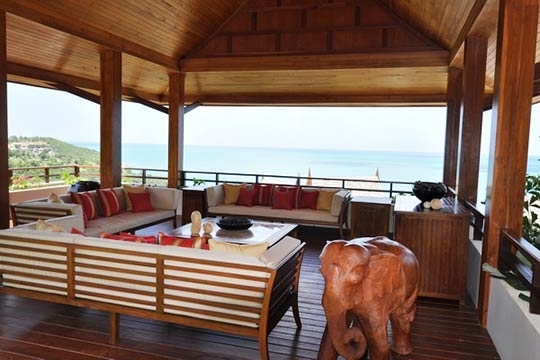 The views from Baan Jakawan are nothing short of sublime and definitely make up for the lack of a beachside ambience. The villa is close enough to the sea to still hear the waves and floating in the infinity pool feels like being suspended in space. The garden terrace and sala by the pool, like the terrace that fronts the main living pavilion, are wide and comfortably furnished, so you can really enjoy the location to the full. Arriving at night, the road that leads through the estate to the villa is only partially lit and this can be quite worrying, especially as you have to negotiate a sharp, steep turn by the villa's entrance. 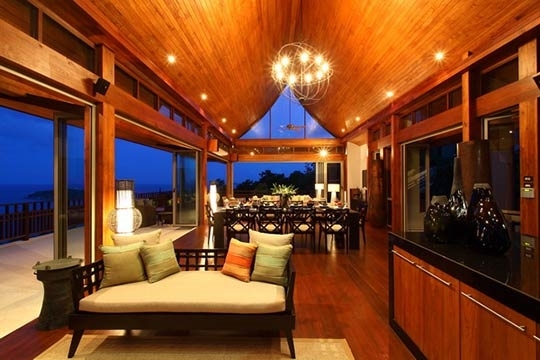 One problem with so much extravagance is that you start looking for faults, but the few we found far from spoiled the stay (uncomfortable TV positioning in the double guest bedrooms and challenging lighting combinations in the living pavilion). The many steps and drop offs are potential hazards for young children and those who are not comfortable with stairs – or heights! If you are thinking of renting, stop looking. This villa is amazing! Excellent service, the villa is gorgeous!! Baan Jakawan sits high on the hillside above Choeng Mon served by a network of private roads that link the various plots in the Narayan Heights Estate. Other villas were being built at the time of our visit (Jan 2010), although none, as yet, interfered with the views. The nearest beach is directly below the villa, but waves here can be higher than on other beaches and there are quite a few rocks beneath the water, so swimmers should be careful. 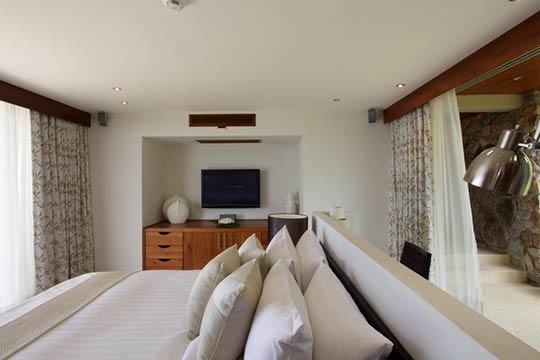 The Bhundari Resort and Karma Samui are both nearby, but with your own impressive choice of private facilities and staff on site there's really not much need or advantage to be gained from venturing out. Electronic gates open onto a car park and open-sided sala with 180° views. 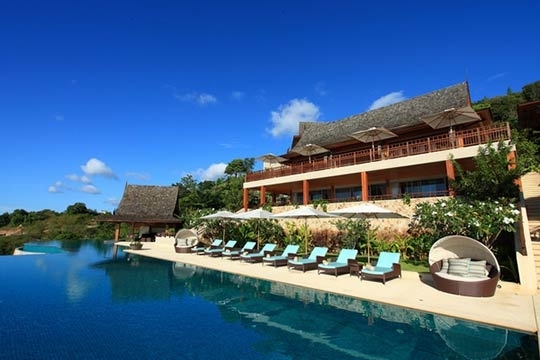 Three pavilions, separated by landscaped gardens, sit on three levels leading down to the 40m infinity pool. On the upper level, steps lead to a bedroom pavilion with covered balconies front and back. 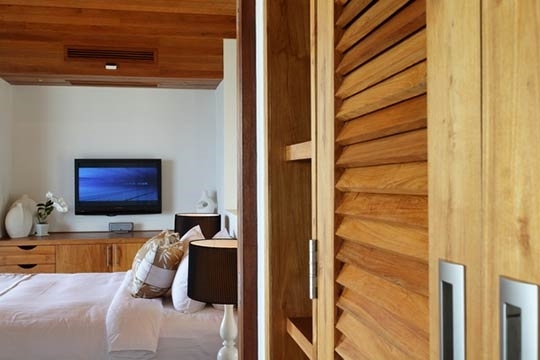 This suite features a centrally placed king-size bed below a vaulted ceiling, plus a desk, flat-screen TV/DVD, dressing area and ensuite bathroom with terrazzo bathtub and walk-in rain shower. The room is cooled by both ceiling fan and air conditioning. 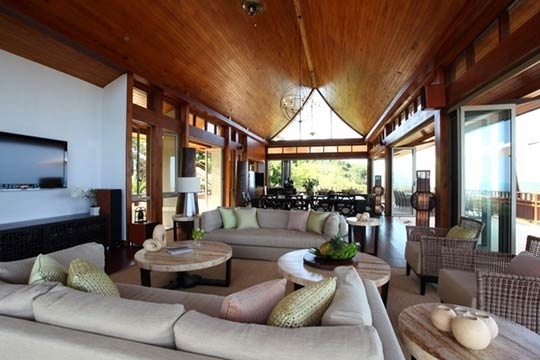 One level below the entrance, the open-plan living pavilion is spacious, fan-cooled (no air conditioning) and luxurious. The equipped kitchen is fronted by two sofas, then the room extends into a dining area (seating ten) and large lounge with wall-mounted flat-screen TV (satellite, DVD) plus a powerful stereo system with iPod dock. 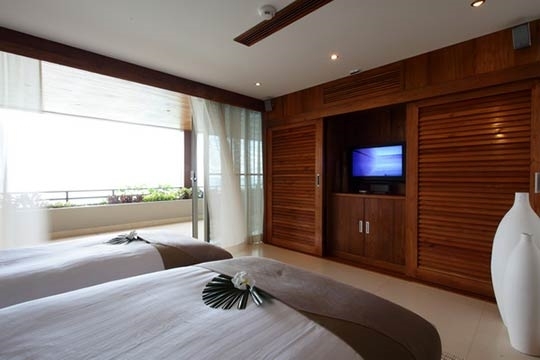 JBL speakers are fitted in the lounge and on the walls of the wide, wrap-around sea view terrace. 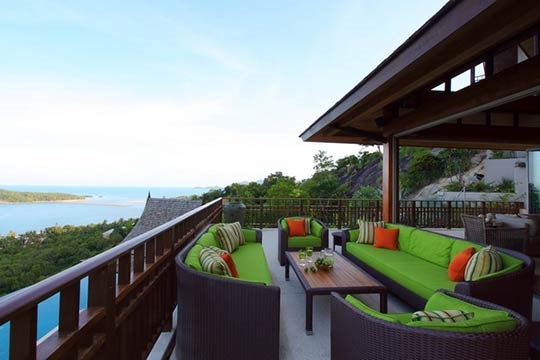 Here, an outdoor dining table seats ten, while a lounge space is furnished with comfortable outdoor sofas. Glass folding doors surround the living pavilion, maximising the views. A separate two storey pavilion, connected by steps and a walkway to the living pavillion houses two more king-bedded rooms. 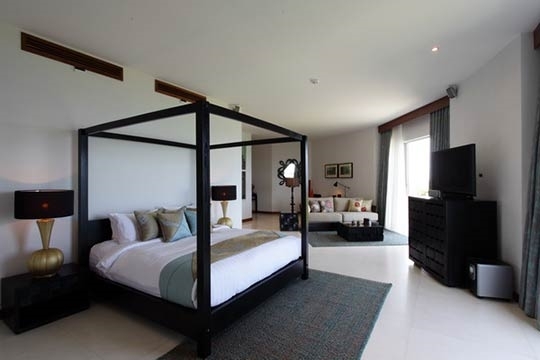 These have the same configuration as the first bedroom, with central beds, built-in desks, flat-screen TV/DVD, dressing areas and sea view bathrooms. 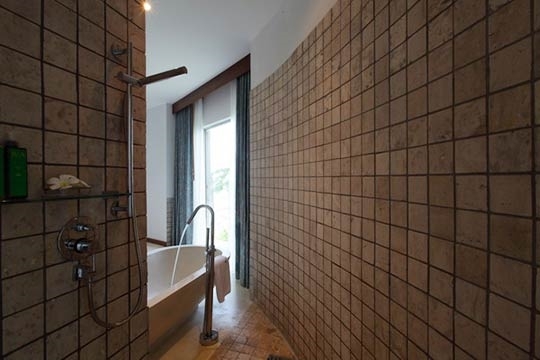 The upper bedroom has a bathtub and rain shower, the lower room just a walk-in shower. Both look out across the pool to the coastal views beyond. 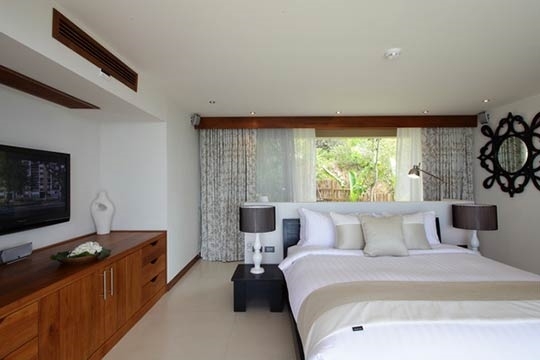 A sand-washed, covered terrace links three ensuite twin bedrooms which sit below the living pavilion. Although each room has its own distinctive décor, all share the same layout with built-in wardrobes, flat-screen TV/DVD, mini-bars and safes. 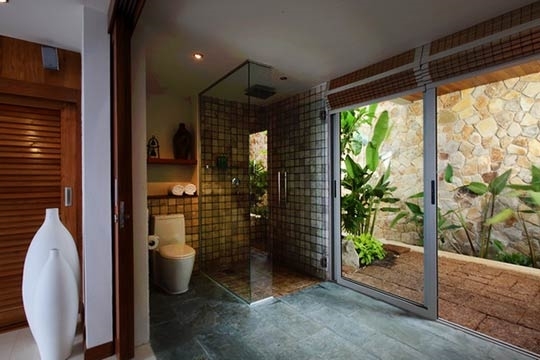 The bathrooms all have walk-in showers, twin sinks, grey stone tiling and sliding doors onto private garden courtyards. On the generous pool terrace cushioned loungers are positioned to enjoy the seascapes and the vast infinity pool is divided into a rectangular lap pool that drops to a circular pool served by a swim-up bar. Attached to the bar is a well-equipped dining sala (seating ten). Steps lead down from this level to the ocean-view master suite. Situated below the circular pool this luxurious suite features a comfortable sitting area and bedroom furnished with a stylish four-poster king-size bed. 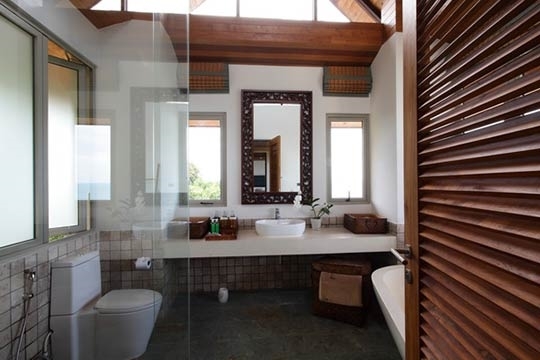 A separate dressing area leads to an expansive ensuite bathroom with indulgent terrazzo bathtub and an open wet room with double rain showers. Lower rates are also available if less rooms will be used. Contact Customer Service for details. 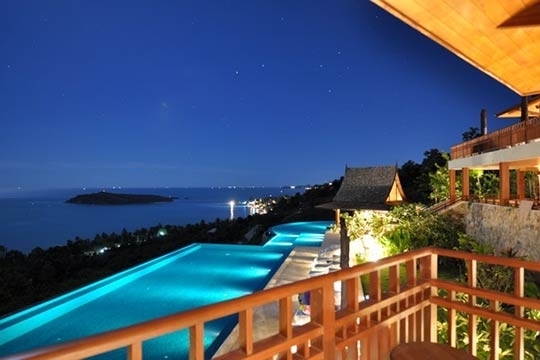 7 bedroom villa located in Choeng Mon, Koh Samui. Ideal for Beach in ten, Body and soul, Bring the relatives, Gastronomic delights, Fair share for groups, The great outdoors, Party pads, Room with a view, Perfect for weddings.